THE EARLY SUPPORTING cast for Billy Joe Saunders’ WBO Interim world super middleweight title showdown with Shefat Isufi on Saturday May 18 can now be revealed, with a number of further title contests to be confirmed shortly. 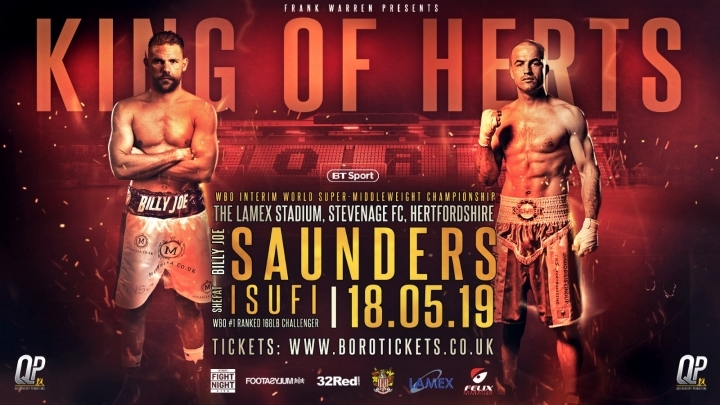 Saunders takes on the WBO No.1 ranked super middleweight Isufi at the Lamex Stadium – home of Stevenage FC – and a number of the top young players in the boxing business will be taking to the pitch bidding to score with knockout performances on the night. After missing out on featuring on the recent Leicester show through illness, the snappy featherweight Ryan ‘The Piranha’ Garner returns to the ring for his ninth professional fight. The exciting 21-year-old from Southampton has recorded six KOs from his eight fights so far and is looking to get himself in title contention this year. Former world amateur champion Willy Hutchinson will have his eighth pro fight in what will be his fifth fight inside a year as the Scot gathers experience in the light heavyweight division, while cruiserweight James Branch jr from Hainault enters into his fifth pro fight seeking a first KO finish. Unbeaten super lightweight Sanjeev Sahota returns to the ring at Stevenage looking to build on his 11 wins so far, with gym-mate Harley Benn having his seventh fight at super welterweight. Long-standing Team GB servant Harvey Horn from Chigwell continues building towards domestic flyweight title action with his sixth pro fight. In a further special attraction on the night, the multi-titled standout amateur star Lisa Whiteside is set to turn professional and will make her debut at the Lamex Stadium. The decorated flyweight – a natural rival for Nicola Adams in the pro ranks – is a seven-time national champion and a 2018 Commonwealth Games gold medallist, who also won silver at the 2014 world championships, having won bronze at the 2012 edition. She is also a European championship silver medallist from 2011. Also featuring on the bill is Streatham super bantamweight Chris Bourke (2-0), Hitchin super middleweight Graham Tirrell (9-0), London light heavyweight Ollie Pattinson (9-0), Aylesbury light heavyweight Adi Burden (8-0) and Milton Keynes middleweight Conor Wright (7-0). ← Is Claressa Shields-Christina Hammer the biggest fight in women’s boxing history?